Dips are a great upper body workout! Calisthenics training is an incredible way to develop functional strength, flexibility, and of course mobility. In this article we will cover the best calisthenics exercises for building strength and why Calisthenics are so good. The beauty of Calisthenics is that when done properly they will develop tremendous levels of strength without excessive wear and tear on your joints and ligaments, as is common with lifting weights. Calisthenics training will help you sculpt long and lean muscles that have “real world” application. Instead of having the build and physique of a bulky weight lifter, you will be fluid and flexible in your movements while possessing great overall strength. Until you have sufficient experience in Calisthenics, it is important that you follow a structured calisthenics program. this is especially true if you want to maximize your strength and conditioning gains. Just like a structured weight room program that a bodybuilder follows, a Calisthenics program should have constant progressions and more challenging exercises that will continue to develop and enhance your current functional strength. An important part of Calisthenics training is ensuring that you work every muscle group regularly. I would suggest three times per week if you are a beginner and up to six days per week if you are a seasoned practitioner. This of course will depend on your goals and how your workout routine is structured. Because Calisthenics promote full body functional strength – you need to make sure you are selecting exercises that target every single muscle group in your body. 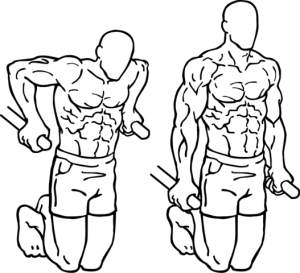 The exercises listed in this article are the common strength building exercises. If you want specific programs to follow, I suggest you look at the books by Al Kavadlo and Paul “Coach” Wade. You can read about their book in the reviews section of this website. Push-ups are one of the best body weight exercises for increasing your strength as there are a stack of variations to increase your strength gains. The most well known variations are the diamond push up, plyometric or clapping push up, decline push up and incline push up. There are other, less known variations such as dive bombers and spiderman push ups. By making the use of the push up and it’s variations, you are able to target and strengthen your chest, triceps, shoulders and upper back. It will also help with your core development. Push-ups are a great litmus test to see how much upper body strength you have. If you are an advanced level calisthenics user you should be able to do at least 50 standard push-ups. If you have been training through the push up progressions, and have developed very good upper body strength, you should be flirting with more advanced push ups like the one handed push up! Pull Ups on a horizontal bar are tough to beat as an exercise to develop your upper body strength. Pull ups really separate the men for the boys! Pull-ups are a challenging exercise and should be included in every training program. They are incredible for developing functional upper body strength and will work your biceps, back, and lat muscles. As with the push up, there are a stack of variations that change the dynamics of the exercise. Pull-ups are the one calisthenics exercise almost every single guy is not performing enough of. Why aren’t people performing pull-ups? Probably because they are difficult! I have seen many guys over the years struggle on a pull up bar who would be considered by regular folk to be “strong” because of what they press in the gym and because of their “mirror muscle” physique. 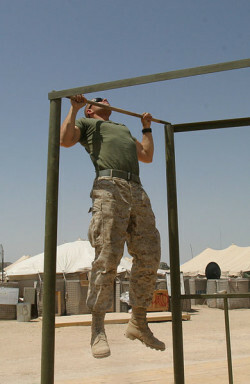 Many people can’t even do 1 pull-up, and the challenge is very intimidating for many. If you fit into this bracket, don’t despair because like all Calisthenics exercises, there are progressions that will take you from 0 Pull ups to multiple one arm pull ups! Body weight squats should form the foundation of your lower body-training regimen while following a Calisthenics program. There are many variations to the body weight squat that range from beginner level inverted squats to the advanced single leg pistol squat. The majority of squat movements will emphasize the quadriceps, glutes and hamstrings. Once again, it does not matter what level you are at, there are progressions that will take you from beginner level through to an advanced level. That’s what I love about Calisthenics. Bridging is the ultimate back strengthening exercise. If you have struggled with back problems in the past, it is highly likely that strengthening your back will reduce the effects. I know that it has helped me as I used to have regular back pain…but not any more. If you have concerns about your back, as long as you follow the progressions and don’t advance to quickly, you will be fine. Before long your back issues will have gone and you’ll have a back like a steel rod! There are different approaches to bridging. The style often seen in Yoga is an Isometric (static) hold. This has its place for sure but I recommend the alternative which uses a repetition based system. Paul “Coach” Wade details this method extremely well in his book, Convict Conditioning. Handstand Push Ups separate the men from the boys. I’ve seen serious lifters struggle with this exercise! You can take it even further by doing it one handed. Handstand Push-ups are hard…..really hard. But, once mastered, there are few exercises that make for such an impressive display of strength as a free standing, plyometric, handstand push up. Like the other exercises listed here, handstand push ups are one of the best body weight exercises for increasing both your core and upper body strength as well as developing your balance. They do a lot to increase your strength gains. If the idea of being upside down daunts you, push past those nagging doubts and give this exercise a go. It does not matter what level you are at, as with all Calisthenics exercises, there are progressions that will take you from beginner level through to an advanced level. You can’t have an outstanding Calisthenics program without working your core. You can do either floor abdominal exercises or bar abdominal exercises. Floor exercises include exercises such as the stomach crunch, vertical leg crunch, and knees bent crunch and horizontal leg crunch. Bar abdominal exercises include hanging knee raises, leg lifts, L-Sits, Roll overs etc. All of these exercises will develop your core and give you incredible functional strength. but I recommend the bar exercises as they provide massive increases in core strength. The important thing to remember about Calisthenics training is that although there are many advanced variations to every single exercise I just mentioned, you can still get an incredible workout in just using the basics. The exercises that I just listed are the best Calisthenics exercises and will give you a full body calisthenics workout. They should form the foundation of any training program. The important thing is that you push yourself outside your comfort zone and go until failure (loss of form) on all of these. Just like training in the weight room, if you want results with Calisthenics you will have to work hard! Sign up to our newsletter to stay up to date with whats going on in the world of Calisthenics. To return to the Strength and Stability homepage click here.